Waverley is an 1814 historical novel by Sir Walter Scott. Initially published anonymously in 1814 as Scott's first venture into prose fiction, Waverley is often regarded as the first historical novel. 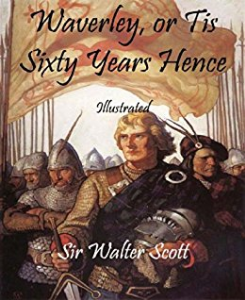 It became so popular that Scott's later novels were advertised as being "by the author of Waverley". His series of works on similar themes written during the same period have become collectively known as the "Waverley Novels". In 1815, Scott was given the honour of dining with George, Prince Regent, who wanted to meet "the author of Waverley". It is thought that at this meeting Scott persuaded George that as a Stuart prince he could claim to be a Jacobite Highland Chieftain, a claim that would be dramatised when George became King and visited Scotland. Sir Walter Scott, 1st Baronet, FRSE (1771-1832) was a Scottish historical novelist, playwright, and poet.